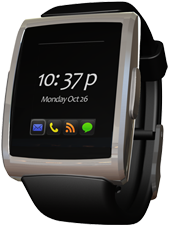 inPulse is a watch which connects wirelessly to your phone by BlueTooth®, alerting you instantly of incoming emails, SMS and Phone Calls. inPulse extends the functionality of your BlackBerry smartphone, so when you’re in a pinch you can check your inPulse instead of fumbling around with your phone. inPulse features an elegant user interface with 1 button interaction. It grabs important information like, caller ID, text messages, email titles, calendar alerts and displays it on a colour OLED screen. The watch body is crafted from high-grade materials and is fitted to a custom wrist band. It also allows you to read recent Tweets from Twitter, or any updates from your RSS feeds, but i’d rather read them directly off my device, so I wouldn’t look crazy staring at my watch during a meeting. Now don’t get it mistaken, this is not a BlackBerry Watch, but a watch that connects to your BlackBerry over bluetooth so that you don’t always have to grab your device from your holdster to see who’s trying to contact you.